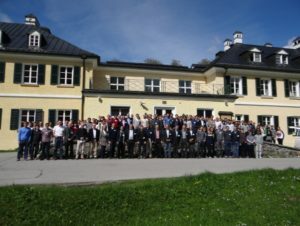 3rd International “Solar Technologies Go Hybrid – SolTech” meeting – Wildbad Kreuth, Germany, 27th – 30th April, 2014 organized jointly by the Universities of Bayreuth, Erlangen-Nürnberg and Würzburg, and the Technical and Ludwig Maximilian Universities in Munich. SolTech is an interdisciplinary consortium of chemists and physicists at five different Bavarian Universities initiated by the Free State of Bavaria to explore innovative concepts for converting solar energy into electricity and non-fossil fuels. Humanity will exhaust the Earth’s supply of petroleum, natural gas and other fossil fuels in the foreseeable future. Non-fossil energy sources, such as sunlight, cannot yet replace current fossil and nuclear fuels, so that a major effort is needed to secure the energy supply of the future. This is the task to be undertaken by chemists and physicists of five Bavarian universities joined together in the state-funded research network „Solar Technologies Go Hybrid“. Between April 27th and 30th April, 2014, over 150 delegates met in Wildbad Kreuth for the 3rd International Conference “Solar Technologies Go Hybrid – SolTech” at Wildbad Kreuth. This meeting was the third in a series that started in 2012 in Munich and continued in 2013 in Kloster Banz. The emphasis of the meeting was placed on reviewing the current status and assessing future research and development activities. Experts discussed topics in the areas of photovoltaics and of techniques with which solar energy can be stored as chemical energy. A prominent example of the latter is splitting water into oxygen and energy-rich hydrogen fuel in an environmentally friendly process using plant photosynthesis as a role model. The conference provided an excellent opportunity to learn about the latest developments and current projects and to exchange experience with other experts in order to initiate new projects in the growing field of solar fuels. The Conference included nine plenary talks from prominent researchers from Europe and the USA in addition to 28 oral presentations and 81 posters in which SolTech members showcased their research. The first plenary talk was given by Rene Janssen (Eindhoven University of Technology, NL), who spoke of his research into using organic materials as a means to convert solar energy, gave the conference an excellent start. The first day concluded with an outstanding contribution in the area of mechanistic studies on artificial photosynthesis from Leif Hammarstroem (Uppsala University, Sweden) followed by the first of two excellent poster sessions. The second day began with Colin Nuckolls (Columbia University, NY, USA) talking about his nanobowls, nanowires, and nanoribbons. Following lunch, Kees Hummelen (University of Groningen, NL) showed some very impressive approaches to enhancing charge-separation properties by means of molecular materials. Towards the end of day two Frank Wuerthner (University of Würzburg) reported on non-covalent interactions between perylenes and mercocyanines as materials applicable in organic photovoltaics. The day was rounded off by the second poster session. Ulrich Lemmer (Karlsruhe Institute of Technology) and Tomas Torres (Autonoma University of Madrid, Spain) were the two highlights of the third day. They covered the fields of device architectures and synthesis of molecular building blocks for photovoltaics and artificial photosynthetic systems, respectively. The last day started with a plenary talk by Andres Hagfeldt (Uppsala University, Sweden & Ecole Polytechnique Federale de Lausanne, Switzerland), who described the status quo in dye-sensitized solar cells. Finally, Michael R. Wasielewski (Northwestern University, Evanston, IL, USA) closed the conference with a talk on molecular singlet fission accomplished in solid state crystals. These were awarded prizes sponsored by the Royal Society of Chemistry. Please also have a look here to view the program. Frau Parisa Khoram, Masterstudentin in der Arbeitsgruppe Solar Tech/Lehrstuhl Professor Christoph Brabec, hat für ihre besondere akademische Leistung und ihr interkulturelles Engagement im September 2013 den ‚Hans-Wilhelm und Helga Schüßler-Preis‘ erhalten. Die ausgezeichneten Preisträger/innen werden wie beim DAAD-Preis-Verfahren von der Kommission für Internationalisierung bestimmt. Frau Parisha Khoram, Masterstudentin in der Arbeitsgruppe Solar Tech/Lehrstuhl Professor Christoph Brabec, hat im Juni 2013 von der ‚Stiftung Industrieforschung‘ zur Unterstützung ihres Master Projektes ein sechsmonatiges Stipendium erhalten. Die SolTech Repräsentanten der wissenschaftlichen Mitarbeiterinnen und Mitarbeiter organisieren einen Workshop für Studenten und Doktoranden der Key Labs.